Leonard Cheshire Cymru, and another representative of the charity. Clwyd South MP Susan Elan Jones has met in Parliament with disability charity Leonard Cheshire Cymru to mark a new Welsh Government policy that will get rid of 15-minute "flying" care visits. The law change aims to ensure disabled people and others with personal care needs have a statutory right to longer visits. Leonard Cheshire Cymru has described the breakthrough as "really good news". "This is great news - and a fantastic tribute to the pioneering work of the Welsh Labour Government," said Susan Elan Jones. 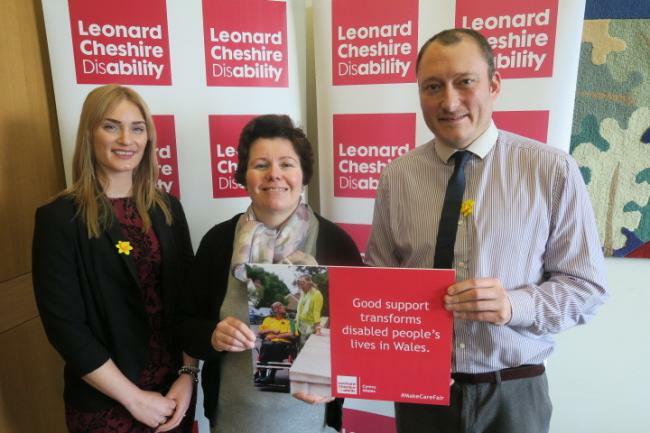 "I meet with disability charities in Parliament and also have a close link with the excellent Leonard Cheshire care home in Dolywern in my constituency. "I know how delighted disability and care organisations are with what the Welsh Government has done. The move will revolutionise personal care and make a real difference to so many people's lives." Leonard Cheshire Cymru said in a statement: "This is really good news! "We're looking forward to working with the Welsh Government to make sure this means that everyone who needs them is able to get dignified home care visits with enough time to do important tasks like getting up and having something to eat."